MARCA | by Luis Ángel Maté | Cycling can be quite a sport and a spectacular show, and yesterday we experienced a race in all caps. A monster stage from start to finish, in which all the heads of state were fighting for their lives, without holding back an ounce of strength. You have to take your hat off to Alberto Contador. He was the one who unloosed the hostilities among the GC men, and that has huge merit. Nairo also showed that when he goes on the attack, he wreaks havoc. He and his team were formidable. Here’s an anecdote to give you glimpse of what a star Alberto is: We were in the Froome group before the final climb and George Bennett, the Lotto NL-Jumbo rider, came up to me. He looked at me and said, and I quote, ”Alberto is so good! He’s an absolute crack rider. And he’s not even at 100%!” Sincerely, for the spectator it’s a complete blessing to have him, and for his opponents he’s a true nightmare. He doesn’t have his best legs, he’s not up to full speed, but nevertheless, he tries to do his own thing, which is always something worthy of the genius that he is. I enjoyed myself, too. I was in the Froome group, and on Formigal I knew that when Luisle sat up it was a no go. So, I felt pretty good so I jumped ahead a little. I’m an offensive cyclist, I like to go on the attack whenever possible, and yesterday I wanted to do a little test to take a reading on my form. As I said, it was a brutal day for us, really, really tough. And very beautiful for the fans. Besides, it was one of those stages that really shows the value of teamwork in this sport. Without the lieutenants things wouldn’t have turned out as they did; it’s important to acknowledge them, too. Even though this day highlighted its leading men, it was really a day to take your hat off to all those who were in the fight. August 30, 2016 - Contador: "I'm here to enjoy the race, to take it one day at a time, and to see how far we can go"
Alberto Contador held a press conference today, the first rest day of this edition of the Vuelta a España. 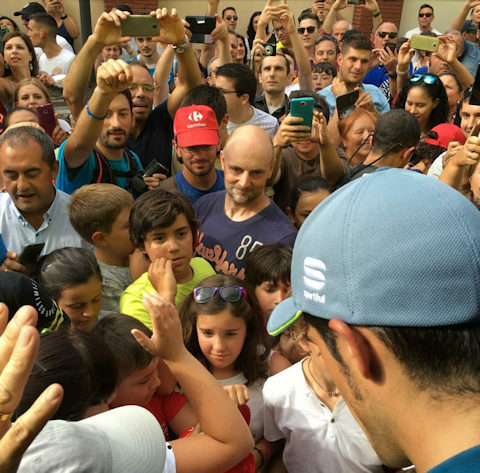 He spoke frankly about his remaining chances for victory, as well as about his plans from here to Madrid. He also addressed the topics of power meters and the 3-km rule. How do you feel now, after yesterday’s stage? There’s a ton of different feelings. If I analyze the tactics of the stage right now, I’d probably have been more cautious. That was my idea for the three stages after my accident and maybe I’m a little too impulsive at times. Yesterday I made a move when it probably would have been smarter to stay in the group, but in the end, that’s how I am. It’s complicated for me to change the way I ride. I am, clearly, very far behind in the GC, and our chances to win are few and far between. You’ve said that you could’ve been more cautious, but if you still want to win the Vuelta, you’ll have to be yourself. You don’t have any other options. We have to look at the race on a day-by-day basis and take advantage of the opportunities, but I also have to see how my legs respond. We also have to take into account the route that lies ahead. There are lots of stages with a solitary climb, one where you don’t have many options for making tactical moves. Nevertheless, once again, we’re going to take it one day at a time, taking advantage of the opportunities, enjoying the race and seeing what we can do. Apart from what happens in this Vuelta, do you think that you should change your style and ride more like Froome, looking at his watts on the handlebars? No, no way. I think that the power meters rob the race of spectacle and spontaneity. They make it so that everything is much more controlled, and if you have a very powerful squad and if a rider attacks, they can keep him under control. You’ll always know your watts and you’ll know that those watts after twenty minutes will be finished. That’s how it is, that’s the reality. However, right now, I think that it’s really difficult for me to change my way of riding. How do you feel right now, both physically and psychologically? I feel good and I’m enjoying the race. I think that the days left in this race will tend to be good for me, and I'm happy that there’s still a large quantity of tough days in this race, rather than just a few, since that means more opportunities. I'm going to try to get good results and give my utmost, but one has to be aware that it will be difficult with my place in the standings, at three minutes behind Nairo, It's not just a question of being three minutes behind him, it's also the fact that he has shown that he’s very strong and has an extremely strong team. That means having to jump more hurdles in order to do it all, but if I continue in the Vuelta, it’s not simply because I want to ride, it’s because I want to try to do something. How do you feel after the accident? I feel better, and I’m improving day by day. My body is less bloated, because after an accident you retain more fluid, and in this sense I think that every day will be better. It’s a shame that the wreck came just before the first three mountain stages. I survived the first two, but, unfortunately, in the final one I probably committed a tactical error. We hope and believe that we’re going to improve every day. Do you think that it’s possible to do a repeat of Fuente Dé? I don’t know. I have to study the road book and search for a strategy that we could consider. We have to evaluate different situations: what the other teams are going to do and whether we try to control the race or leave all the responsibility to Movistar. Maybe I´m repeating it too much, but I’m here to enjoy the race, to take it one day at a time and to see how far we can go. The day after your accident, you made some comments about the final 3-km rule in the sprint. Could you expound a little on what you meant? Yes, the other day, I put this reflection on the table. I know that there are all kinds of different opinions, but I think that cycling in recent years has changed in that respect. Before, GC riders were maybe a little farther back in the final kilometers, but now, on the contrary, they see sprint finishes as opportunities to gain a few seconds. I´m not criticizing this, and I respect that everybody has his own way of formulating tactics. However, I think that the sprinters don’t like it that the GC men are battling with them, at 70 kilometer per hour. At the same time, we, the GC riders, don’t much like battling with the sprinters – riders suited to fast, flat terrain – because we know that it’s not our place. It’s true, however, that there’s a high number of tense moments, and maybe it’s good for the sake of drama and excitement. However, it comes with risk, owing to the fact that a GC rider, possibly one of the favorites, might end up having to go home. Additionally, it’s true that the races’ promotional videos almost always show the crashes from the year before. I don’t know, it could be that we might think carefully about whether accidents should really be considered a thrilling show. People might think that I’m saying this because I crashed, but it’s something that I think about. I also think that the majority of the peloton shares this point of view, because we put our lives at risk every day in those mass sprints. Maybe we need to think about whether there’s some course of action that we could take. I don’t want to be the poster boy for a change of rules, but I think that this is an interesting thing to reflect on. Alberto Contador distanced Froome, Valverde, Chaves and all other direct rivals on the slopes of La Camperona today as he pursued a late-stage attack by Nairo Quintana that netted the race leadership for the Colombian. Alberto finished the stage in 13th, 5:06 behind stage winner Sergey Lagutin - who won from the day's breakaway - and 25" behind Quintana (12th). He now moves to 7th in the GC, 1:39 off the overall pace of Quintana. Alberto Contador was knocked over by another rider and crashed heavily against the barrier while rounding the last curve into the finish of Stage 7 of the Vuelta a España today. He crossed the finish line with a ripped and bloodied jersey and shorts, due to injuries all over the left side of his body. Samuel Sánchez and Chris Froome also went to the ground, but were unharmed. Doctors found no broken bones, but the painful, deep abrasions may force Alberto out of the race. He and the team will evaluate his condition Saturday morning, before the first serious summit finish of this edition. 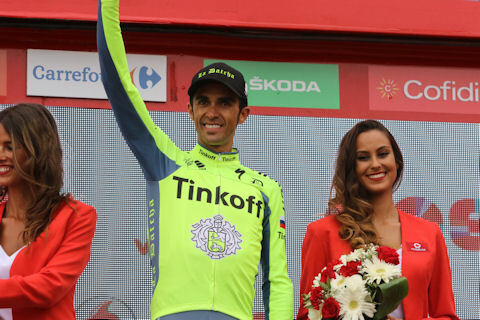 Alberto Contador survived a taxing workday of high pace and tricky descents today in Stage 6 of the Vuelta a España. What seemed bound to be a day for a strong breakaway became a scramble for team leaders to maintain places. In the end, Simon Yates escaped to win solo with Movistar in hot pursuit. Contador finished 15th, riding in with the other race favorites at 29 seconds behind Yates. Contador now moves up a notch in the GC order to 12th, still 1:52 back. Colombian Darwin Atapuma, described by his teammate Samuel Sánchez as “like a kid with new shoes,” keeps the leader’s red jersey for another day. The powerful Movistar team drove a stiff pace near the end, because, as Alberto said, “with a rider like Valverde, they had to play for the stage.” Tinkoff did their job and stuck to the front, however, protecting their leader, and Movistar’s bid came to nothing. Before today’s stage there was a moment of silence in observance of the devastating earthquake that hit Italy yesterday. Contador’s Italian teammates Daniele Bennati and Manuele Boaro wore black armbands throughout the day, and with Tinkoff director Ivan Basso and other Italian members of the peloton, they formed a united front with the Italian flag at the start line ceremony. Stephen de Jongh, Tinkoff DS: “It was another very hot and, actually, a hard day today. They were racing full gas all day, but the boys did a good job – at the dangerous point they were in front which is what we asked of them. Kiserlovski didn’t take the start and Boaro had a bit of a difficult day but we know he will come around. Kiserlovski, a crucial helper for Contador in the mountains, fell to the ground and was spotted writhing in pain, clutching his left collarbone. The Croatian was attended by the race doctor and Tinkoff director Stephen de Jongh, then was able to pedal to the line without using his left hand before being taken to the hospital for x-rays. Only a handful of riders in the very front, disputing the sprint, were unaffected. Gianni Meersman won from this group. Since the 3-km rule was put into effect, Contador finished in the same time as Meersman, and Darwin Atapuma kept the red jersey. Alberto was pulled to the front of the peloton by Daniele Bennati shortly before the final sector, “in order to avoid risks, but for that reason only, since we’re fighting for the GC,” Alberto explained. The weather today was bad from the start, although the roads were dry for the arrival in Lugo. "Today got hard,” Alberto said, in summary. “It rained during the first 120 kilometers. The most important thing today was to be safe in the final kilometers. I have to be thankful for the work of my team; Benna was amazing." "That's another day gone by; the important thing now is to recover. I still can't draw any conclusions about my form. There's a lot left ahead," he said. Concerning form and his situation in the GC, Alberto said to reporters before the stage, “I expect to keep improving. There’s a lot of race left and it will be complicated to control, because to do that you need a team that’s powerful in doing that. It’s clear that being 1:20 from your rivals is not the best way to start the Vuelta,” he said. “Of course I don’t give anything up for lost. The time differences to my opponents are big, but there’s a lot of Vuelta left and we’re going to stay in the fight,” he concluded. Stephen de Jongh, Tinkoff DS: “It was a very hectic final after a steady stage. It was raining during the stage and the temperature was down to 19 degrees from 39 yesterday, so that was hard for some guys but the team did a good job again today. Alberto Contador finished in a reduced group of GC men today in Stage 4 of the Vuelta a España at the end of a taxing 2nd-category climb. Aside from the uphill finish, the second so far in only four stages of this edition, it was just another day at the office for the favorites. A large breakaway took all of the intermediate prizes and produced the solo stage winner, Lilian Calmejane. The final climb was no picnic at 11.2 kilometers, but the big names opted out of a dogfight, preferring to stay calm, keep an eye on each other, and wait. Contador was succinct in his assessment after the stage. "Physically, I felt normal. Not super,” Alberto said to reporters. “The wind was really blowing. I wanted to be cautious after what happened yesterday. We've survived the day." Stephen de Jongh, Tinkoff DS: “It was a pretty straightforward stage today, with no problems for Alberto or the team. The boys worked hard to put Alberto in position ahead of the final climb and overall it was a better day than yesterday. 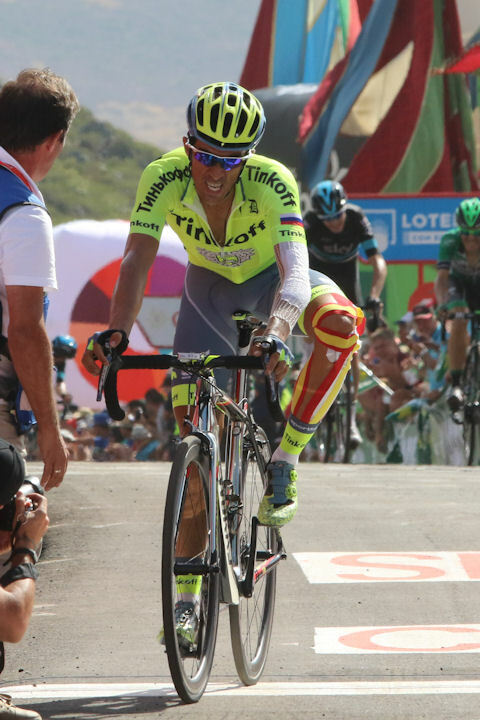 Alberto Contador felt the sting of the uphill finish to Mirador de Ézaro today in Stage 3 of the Vuelta a España. He stuck to the favorites’ group for most of the severe incline, but dropped back in the finale meters, losing time again to his most direct rivals. He finished the stage in 9th behind Alexandre Geniez, who won from the breakaway of the day. “It hasn’t been a good day in the GC, but as I said before, La Vuelta is a long way from over and the time differences are still not very large. 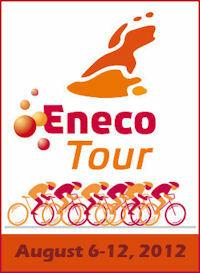 I’m not satisfied, but I feel that my form will improve in the upcoming days,” Contador said after the stage. Ézaro was a big task for Contador’s legs, which are in the process of recovering from injuries sustained in the Tour de France. It’s important to remember that, and to consider that as the plot thickens in this Vuelta, he is likely to be fresher than his rivals who completed the Tour and participated in the Olympics in Rio. Stephen de Jongh, Tinkoff DS: “In the end, Alberto didn’t have the oomph to continue in the front, but in reality he feels confident about this race and is motivated about what is yet to come. The rest of the guys have ridden well again today, and in the final part we had Jesús, Rovny and Trofimov there until the last hour, so the team has worked very well. We have to continue to take it step by step." Alberto Contador stayed clear of two crashes in the mad scramble for the finish line today, and so survived Stage 2 of the Vuelta a España. "These types of finales are always complicated,” said Alberto after the race. “The race goes very fast, everybody wants to be in front, and there's not much space." The last-minute brouhaha resulted in a win by Gianni Meersman in a bunch sprint, thus ending an otherwise piano day. “I felt well but it's not a day for drawing many conclusions. It was a very relaxed stage," he continued. No news was good news after yesterday’s team time trial debacle. Contador, who faces tomorrow’s beastly (albeit short) uphill finish at Mirador de Ézaro with a 52” disadvantage, is doing his best to cope: "I'm going to take the race one day at a time, remaining calm. Yesterday showed that there are stronger teams here than mine. Movistar and Sky got a good advantage and it will be difficult to get it back. Tomorrow we'll see what can be done and after the stage we'll do an analysis." Stephen de Jongh, Tinkoff DS: “The boys did well today to keep Alberto out of trouble, and everyone stayed safe and did a good job. It was a hot day and the had to work together – Sergio did a good job with the bidons and the other guys worked well so we can look ahead to tomorrow. A strikingly under-par performance by Tinkoff in the team time trial today put Alberto Contador on the back foot on day one of the Vuelta a España. The team finished in 8th place, 52 seconds behind the winners, Sky, who ended the stage only a fraction of a second in front of Movistar. In July his plans for another Tour de France win, not to mention his Olympic participation, were ruined by two crashes in France, and now today’s bust threatens to wash out Contador’s options on a fourth Vuelta. One can only hope that the team will rally for their leader, starting tomorrow. It is a long way to Madrid.